Johannes Bugenhagen (24 June 1485 – 20 April 1558), also called Doctor Pomeranus by Martin Luther, introduced the Protestant Reformation in the Duchy of Pomerania and Denmark in the 16th century. Among his major accomplishments was organization of Lutheran churches in Northern Germany and Scandinavia. He has also been called the second Apostle of the North. Johannes Bugenhagen was pastor to Martin Luther at St. Mary's church in Wittenberg. He is also commemorated in the Calendar of Saints of the Lutheran Church - Missouri Synod as a pastor on 20 April. Bugenhagen was born in Wollin (now Wolin), Duchy of Pomerania, on 24 June 1485 as one of three children of local Ratsherr Gerhard Bugenhagen. From 1502 to 1504, he studied artes at the University of Greifswald. In 1504, he moved to Treptow an der Rega (now Trzebiatów) and became Rector of the local school. Though he had not studied theology, he was ordained as a priest in Treptow's St. Mary's Church in 1509, and served as a vicar at the Kanonikerkolleg of that church thereafter. In 1517, abbot Johann Boldewan called Bugenhagen to his nearby Belbuck Abbey, where he was appointed Biblical lecturer, where Boldewan and Bugenhagen became the core of a Humanist circle. Duke Bogislav X of Pomerania ordered Bugenhagen to write down the history of Pomerania in Latin. The year 1518 is the beginning of historical writing of the combined territory Pomerania. 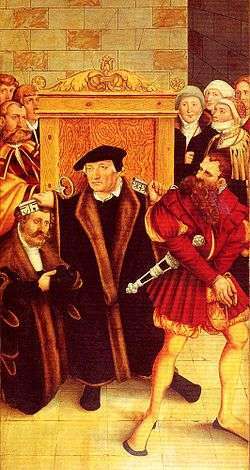 Bugenhagen first encountered the theology of Luther in the reformer's Prelude on the Babylonian Captivity of the Church in 1520. At first he did not like Luther's thoughts at all. However, once he had studied it more, Bugenhagen became a supporter of the Reformation and moved to Wittenberg. 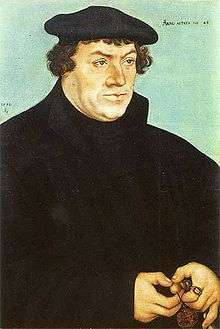 In Wittenberg, Bugenhagen was elected parish pastor on October 25, 1523, making him Martin Luther's pastor and confessor. 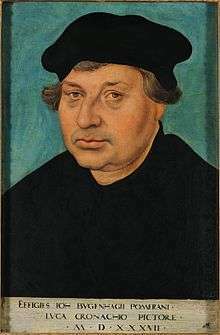 He was a member of Luther's team translating the Holy Bible from Latin to German, and opened the debate on Ulrich Zwingli's reforms. By 1523, his private lectures had become well known, so he was called to lecture the following years at the Leucorea, the university in Wittenberg (today Martin Luther University). Bugenhagen was among the most important teachers and practitioners of biblical interpretation in the Wittenberg-centered Protestant Reformation and ordained a generation of Lutheran pastors who had been educated at this university. On 17 March 1533, he was promoted doctor of theology at the university of Wittenberg, together with Johannes Aepinus and Kaspar Cruciger. 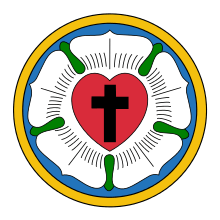 The promotion was supervised by Martin Luther, based on Philipp Melanchthon's theses, financed and attended by Frederick III, Elector of Saxony, and formally granted by deacon Justus Jonas. With the ceremony in Wittenberg's castle church (Schloßkirche), Aepinus, Bugenhagen and Cruciger became the first three Protestant doctors of theology. While theological doctoral promotions had been suspended in Wittenberg for the preceding eight years, the promotion of Aepinus had become necessary as the Hamburg burghers demanded their new superintendent to bear the title of a doctor. [nb 1] Melanchthon had written the speech for Jonas which laid the foundation of a Protestant doctorate, and Frederick III "the Wise" sponsored a subsequent celebration to introduce the new Protestant doctorate to the theological world. After he had outlined his reform ideas in a letter to the Hamburg community, Bugenhagen was the most important figure in the Protestant Reformation in Northern Germany and Scandinavia. He took an active lead in creating new church orders (Kirchenordnungen) for Hildesheim (1544), Hamburg (1528/29), Lübeck (1530–1532), the Duchy of Pomerania (1534/5), East Frisia (1534/5), Schleswig-Holstein (1542), Braunschweig (1528), Brunswick-Wolfenbüttel (1543), and Denmark-Norway (1537), where he also crowned Christian III. This earned him later the epithet second Apostle of the North. Not only did he create the new rules, he also established them and convinced people to follow them. Bugenhagen produced rules and regulations for religious service, for schooling, and for social issues of the church. In 1539, he became superintendent of the Lutheran Church in Saxony. Also in 1539, Bugenhagen reformed the Pomeranian University of Greifswald, which he "re-founded" as a Protestant university, modelled after the university of Wittenberg. After the death of Luther in 1546, Bugenhagen took care of Luther's widow and children. Bugenhagen died in Wittenberg in 1558 and was buried at St. Mary's church. Other than for his theological opinions, Bugenhagen was also well-known because of his organising ability. Bugenhagen was also appreciated for his work in making a Middle Low German translation of Luther's Bible in 1534. Johannes Bugenhagen was always a pastor at heart, and because of his love for music, his family coat of arms shows a harp. ↑ Zietz (1834); Schneider (2008), p.4. Nieden, Marcel (2006). Die Erfindung des Theologen. Wittenberger Anweisungen zum Theologiestudium im Zeitalter von Reformation und Konfessionalisierung. Spätmittelalter und Reformation (in German). 28. Mohr Siebeck. ISBN 3-16-148878-4. Kaufmann, Thomas (1998). Reformatoren. Kleine Reihe Vandenhoeck und Ruprecht (in German). 4004. Vandenhoeck & Ruprecht. ISBN 3-525-34004-4. Kopitzsch, Franklin; Brietzke, Dirk (2001). Hamburgische Biografie. Personenlexikon (in German). II. Wallstein. ISBN 3-7672-1366-4. Hans-Günter Leder, Johannes Bugenhagen Pomeranus – vom Reformer zum Reformator. Studien zur Biographie (Frankfurt-am-Main: Peter Lang, 2002) (Greifswalder theologische Forschungen, 4). Hans-Günter Leder, Johannes Bugenhagen Pomeranus - Nachgelassene Studien zur Biographie mit einer Bibliographie zur Johannes Bugenhagen-Forschung, herausgegeben von Irmfried Garbe und Volker Gummelt (Frankfurt-am-Main, Peter Lang, 2008) (Greifswalder theologische Forschungen, 15). Selderhuis, Herman; Wriedt, Markus (2006). DBildung und Konfession. Theologenausbildung im Zeitalter der Konfessionalisierung. Spätmittelalter und Reformation. 27. Mohr Siebeck. ISBN 3-16-148878-4. Steinwachs, Albrecht; Pietsch, Jürgen (2000). Evangelische Stadt- und Pfarrkirche St. Marien Lutherstadt Wittenberg (in German). Edition Akanthus. ISBN 3-00-006918-6. Wikisource has the text of the 1911 Encyclopædia Britannica article Bugenhagen, Johann. Bugenhagen, Johannes, A Christian sermon over the body and at the funeral of the venerable Dr. Martin Luther. Translated by Kurt Hendel, 1996. Ruccius, Walter M, John Bugenhagen Pomeranus; a biographical sketch. Philadelphia: United Lutheran Publication House. Vogt, Karl August Traugott, Johannes Bugenhagen Pomeranus. Leben und ausgewählte Schriften. Elberfeld: Friderichs, 1867. Zietz, Johann Heinrich, Johannes Bugenhagen – zweiter Apostel des Nordens, nach seinen Lebensschicksalen und seiner Wirksamkeit für die Gestaltung der evangelischen Kirche: Ein biographischer Versuch (11829), Leipzig: Sühring, 21834. No ISBN.